This is how you do burgers in the fall. 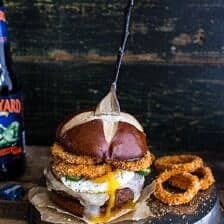 They need to be big, packed with fall goodness, topped with cheesy beer battered onion rings and finished off with an egg. It’s the only way. 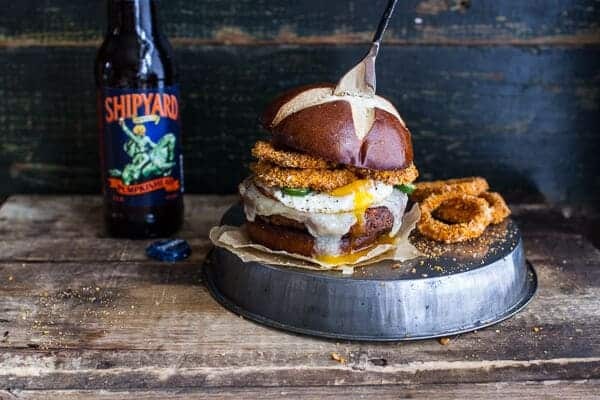 It’s still a totally trashy burger, but healthy because um sweet potatoes, beans, quinoa, onion rings and eggs. All healthiness. All delicious. Don’t you just love when that happens? I certainly do. So today, I really don’t have a lot of words flowing from my brain to my finger tips. See, the truth is that I live the most boring life and I love it that way, but it’s because of this little blog that I actually have to leave my comfort zone and venture out of my little kitchen and office and into the real world. Which I guess, actually makes my life not all that boring. You could even say that it’s been especially exciting lately, but also especially tiring. Like all I really want to do is make some Halloween cookies with little Asher, but the time is just not there. Story of everyone’s life right? Maybe we’ll get to it on Halloween? Better late than never. Some days I have loads to say, but today? The only thoughts that are coming to my mind are one, PEACE. You see, Asher, had a friend over… and her friend’s sister (fall break – I swear I never had all these breaks!). Those girls were so stickin loud that my head still hurts, and so demanding. Jeez. You should have seen the house once the friends left, it looked like a tornado or two went through. Amazing the damage that three tiny little girls can do, they even managed to knock over a dirt bike in the garage. Luckily no one got smooshed. Thought number two? Thought number two is that thought number one makes me so excited that the barn is getting near completion… ok, or at least looking like it will be done this year. Thank God. It’s so time for the move-out to happen. 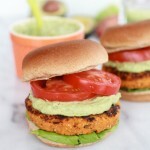 Thought number three is all about these Sweet Potato Black Bean Burgers. They are so good. This is one of those burgers that got dreamt up on a recent hike. I came home and immediately made them. They just sounded so good that I had to push the other planned recipes for the day aside and focus on these burgers. I was pretty excited about them…still am…clearly. 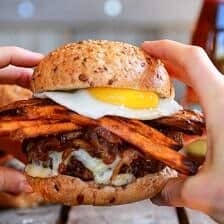 This burger has all my favorite things, including sweet potatoes. Wow, sweet potatoes are so awesome. I mean, I knew this, but I somehow always forget about them and tend to just grab my all time favorite butternut squash instead. 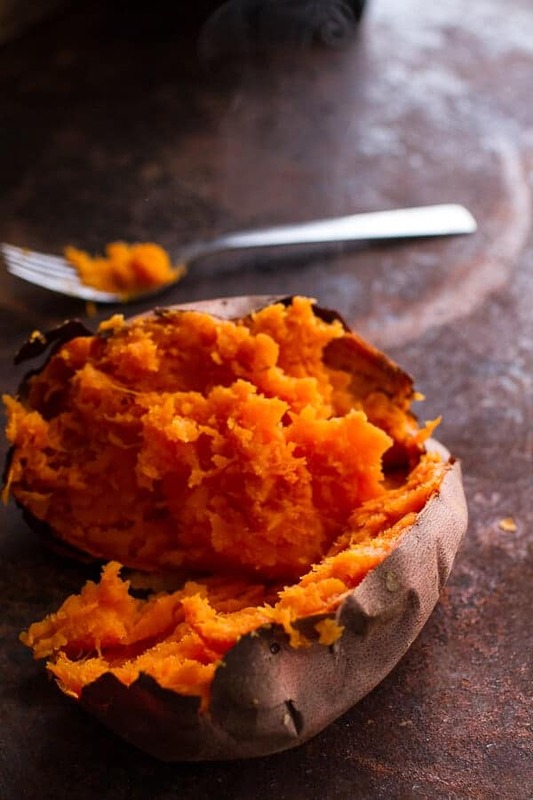 But I am so into sweet potatoes right now, and they are so good for you too. Hello – B6, C, D, iron, potassium, magnesium, carotenoids (which help fight cancer), and more! And can we talk about their gorgeous color? So pretty, so sweet, yep, I just love um. Hoping you do too because I foresee a lot of sweet potato recipes in the future. YUMMERS. 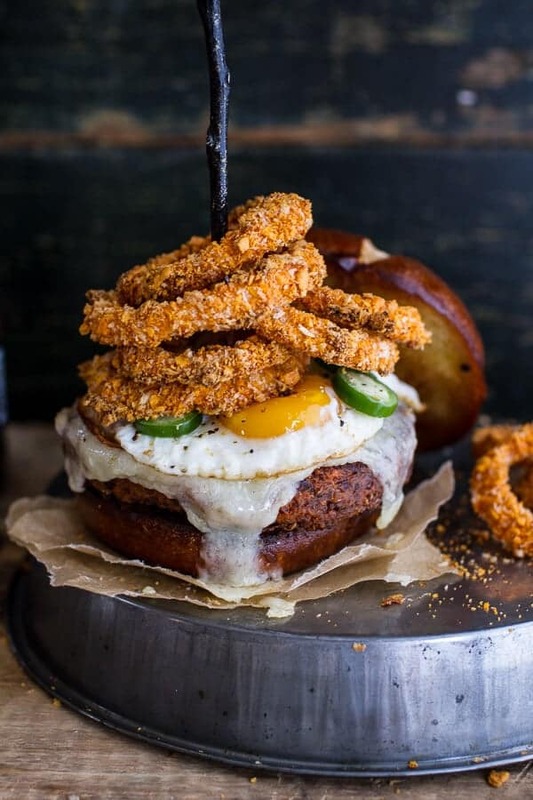 Anyway, these burgers are like chili in a sweet vegetarian form, with cheesy crunchy onion rings and a fried egg, because fried eggs are meant for pretty much every burger. No really, they are. Gotta love a good fried egg. I used a combo of my favorite crispy quinoa burger and an oldie recipe from the earlier days of the blog to put together these patties. But here’s the thing about these burger patties, they are delicate. You just have to be careful flipping them. Other than that they are simple, and if you do end up smushing them a little, it’s really no big deal. Whatever they look like they will still taste delicious. The onion rings are so easy. They’d be delicious fried if you are into that, but baked works great too and there’s a lot less mess to clean up. Plus, they can bake while you cook the burgers, which makes the timing for everything pretty perfect. And you guys, they are cheddar beer battered onion rings. Doesn’t that sound so good? They are. They are. Also, you’d be my hero if you added a brussels sprout slaw to these burgers. I was so close to adding it, but I didn’t want the recipe to get too long. You should do it though!! I served these on some homemade whole wheat beer pretzel buns, but we all ended up not eating the top half of the bun. The truth is, these burger would be perfect served in a “lettuce” bun instead of actual buns… wow, did I really just say that? I am not usually a lettuce wrap kind of girl, traditional burgers n’ buns are usually the way I roll, but lettuce just works really well with these since they’re already pretty carb heavy. Don’t get me wrong, buns are still good, but just sayin – lettuce is equally delish. Either way, you’ll love them and they are the perfect healthy dinner for any autumn night. Oh, and the leftover patties are so good the next day. Think crumbled over a salad or added to a grilled cheese. Double yes! And you can’t forget a little cheddar cheese too. It’s a chili burger after all. And you guys, all chili should be topped with cheese. Duh. 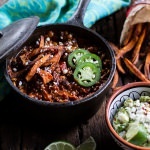 In a bowl combine the quinoa, mashed sweet potatoes, mashed black beans, tomato paste, egg, chili powder, smoked paprika, cinnamon, cayenne, salt, pepper, brown sugar and worchestire. Mix well to moisten the ingredients and then mix in the shredded cheddar cheese. Mix well again and form into 4 or 5 equal burger patties (I made 4). The mixture will be very wet and sticky, this is fine, just make rough circles. Place on a plate lined with wax paper and place in the fridge while you prepare the onion rings. 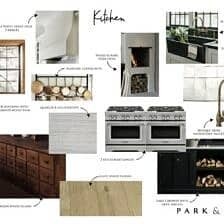 Preheat the oven to 450 degrees F. Line 2 baking sheets with parchment paper or a silpat. 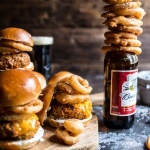 To make the onion rings, whisk together the flour, buttermilk, beer and dijon mustard in medium size mixing bowl. In another shallow bowl, mix together the cheddar cheese cracker crumbs, Panko bread crumbs, smoked paprika, salt and pepper. Bake for 20 to 25 minutes, or until coating is crisp, flipping half way through. Season with salt, to taste. *Adapted from my [Roasted Garlic Sweet Potato Ranch Burgers | https://www.halfbakedharvest.com/roasted-garlic-chipotle-cheddar-sweet-potato-burgers-with-avocado-ranch/]. Don’t let these pictures mislead you, these aren’t really fork and knife burgers. They’re more of a double hands, get messy kind of burger. Which is obviously the best kind of burger. 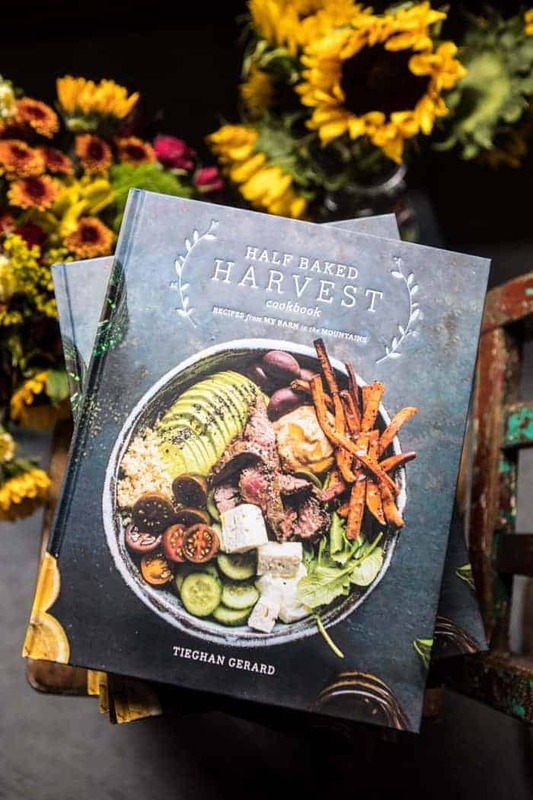 Tieghan, I am utterly in awe at your creative culinary masterpieces! The recipes keep getting better and better! I foresee a Food Network TV show, many cookbooks and multi-Michelin star restaurants in your future! Why do all your recipes look like I want to dive in nose first? My list with recipes I want to try keep on growing faster than I can make the recipes! Thank you so much, Erin! Hope you have a great weekend! This burger looks unreal!! I mean, WOW! You totally nailed this! And, as someone who is feeding a few teenage boys this week, this recipe is going to be well received!! You make some mean looking burgers! I And yeah, I totally understand the lack of words thing, I definitely struggle with that more often that I wish! Thanks Laura!! Have fun this weekend! 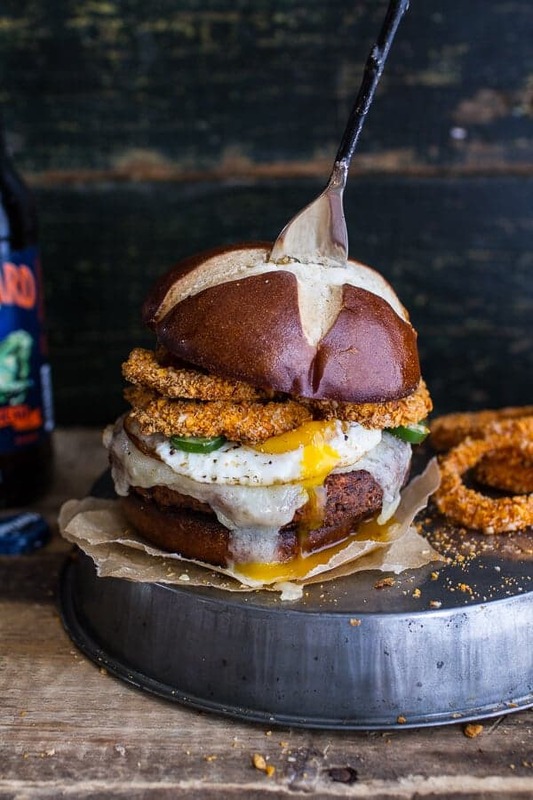 The gooey cheese, the drippy egg – love everything about this burger! Where did you get that fork?! I am in love!! Thanks Courtney!! My dad found the fork for me at a shop in Utah, but I have seen them at Anthropologie and crate and barrel too I think. Wow this burger looks restaurant quality delicious! I can’t wait to try it. I’m always looking for some good black bean burgers! Thanks Caitlin! Hope you love the burger! 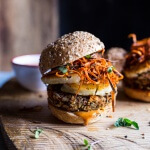 I love black beans burger but never thought adding sweet potato… It sounds like a great combination! Beautiful clicks. This burger is absolutely stunning! And by that I mean I just want to stuff it in my mouth right now. Wow, this looks incredible. Perfect Fall Food! This is so amazing on so many levels . . your brothers and sisters are going to be (if they are not already) total foodies . . at like age 15! Haha! Thank you! They are actually the pickiest eaters…total bummer. Excuse me while I wipe the drool off my keyboard. You had me at burger. 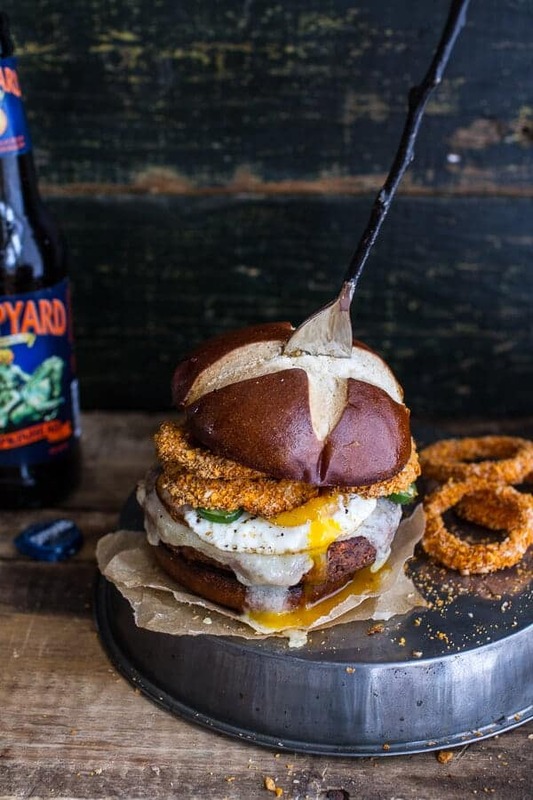 But then you went ahead and added a pretzel bun, cheese, and Baked Cheddar Beer Onion Rings. I’ll be day dreaming about these all day. I’m sold when it comes to onion rings and eggs. Although, I have to say EVERYTHING about this is making me smile. It’s all just so…perfect. Thank you, Nicole! Hope you have a great weekend! Now, THIS is the burger that could get my husband to eat a vegetarian burger. THIS. Haha! Awesome! Thanks so much hope everyone loves these! Oh, sorry for shouting at you, there. It was really a gut reaction. There is nota piece of this that doesn’t sound off-the-wall, ridiculously amazing. You’re a master in the kitchen, girl! You are the best, Rachael! Wow the last entries you posted all seem to include my favorite ingredients! 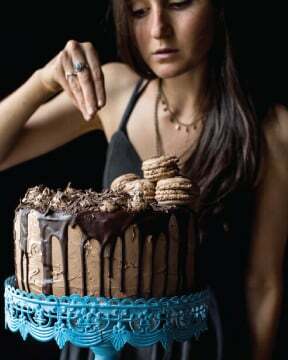 I have been going through your blog saying “omg” reading each recipes name and drooling over the gorgeous pictures!! Will definitely try a couple! Thank you!!! Awesome!! Thank you so much, Nina!! Hope you love everything you try and please let me know if you have any questions. 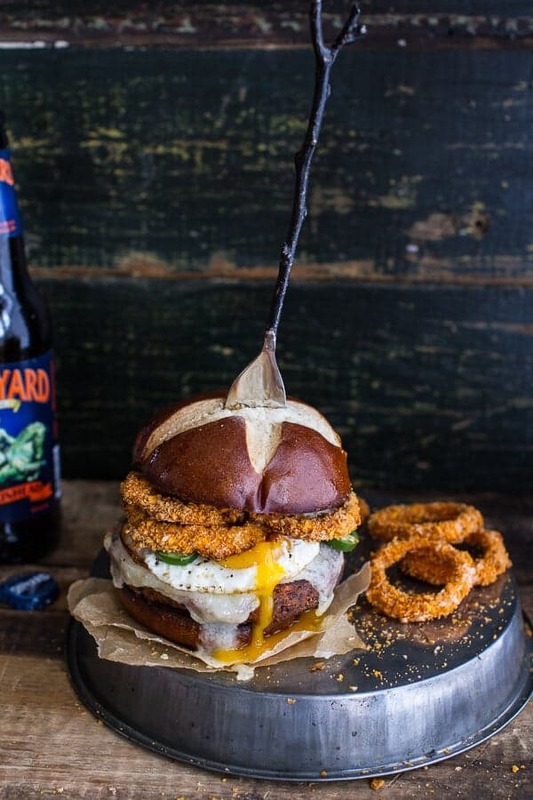 I’m kind of obsessing over those onion rings and your burgers sound killer, as always! OMG, these look so crazy delicious! yum! Thanks Abby! Hope you have a great weekend! Where is the recipe for the pretzel buns? They sound like the perfect bun to go with this gorgeous burger. I only have a recipe for soft pretzels but all you do is shape them into buns. Super easy. Here is the recipe. Hope you love this, thanks! around it. Especially since one would really really really want to take a big bite immediately. Gosh I can’t believe how awesome the onion rings are. Mesmerizing. Haha! I it is pretty big, huh? I have just died and gone to burger heaven!!! I.Need.This. Now! You could sandwich anything between a pretzel bun and I’m going to want it. Loving the cheddar onion rings! My jaw dropped when I saw that burger. I can’t even. Haha! THANK YOU! Have a great weekend, Lindsey! wow. now this is a burger. i can’t wait to try this recipe. it looks delicious! 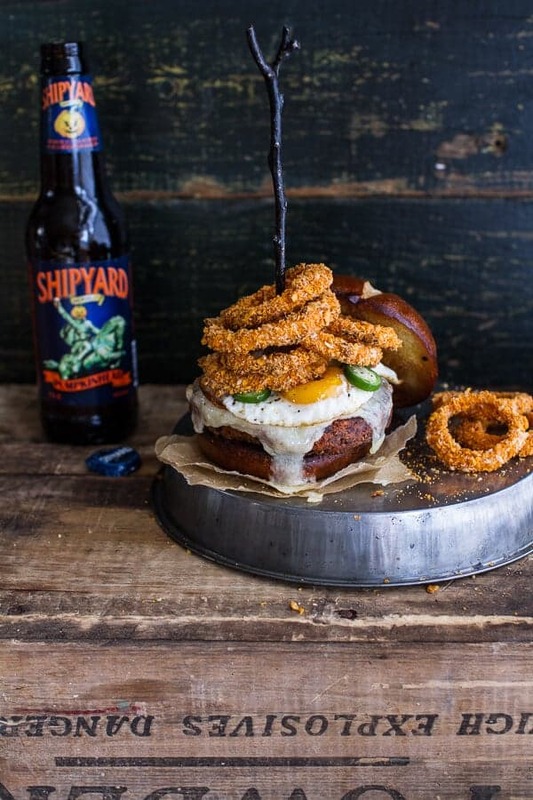 This burger looks amazing…..and that fork! I want! oh my gosh…i was so mesmerized by the pictures that i didn’t even read the recipe until now and didn’t realize this doesn’t have meat. i’ll still try it, though! great pictures (obviously)! Good gosh, you’re absolutely right! This is a chili in burger form and it is gorgeous looking. Lovely work as always, Tieghan. Thanks! I will think about! Hey Sam! Yes, I know this, but thank you for letting me know I did not mention that. I will update the recipe now. Any thoughts on freezing after cooking? I think it will work great. Just be sure to layer the burgers with wax or parchment before freezing so they do not stick together. 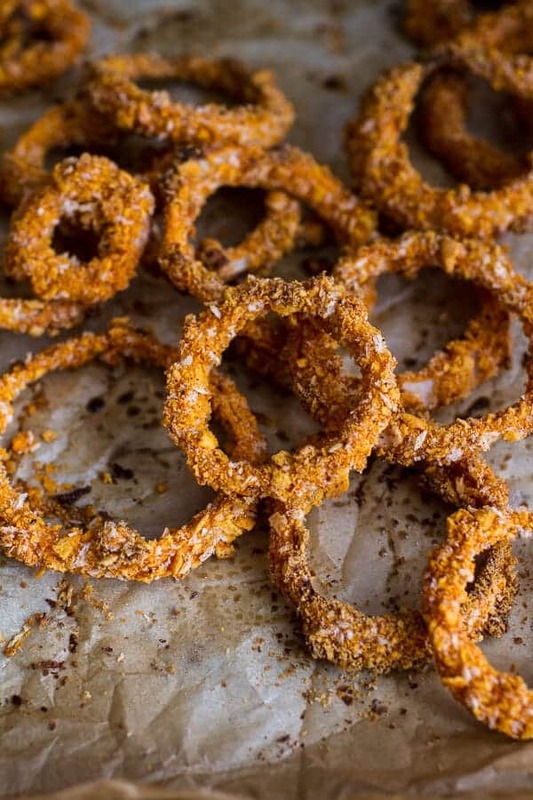 I can’t wait to try these amazing looking baked onion rings! Last week, I got a HUGE bag of baseball-sized onions from my last CSA box of the season and this is going to be such an awesome use for some of them. We love onions in this house! And how can you go wrong with beer and goldfish crackers?!?! Thanks so much for sharing this recipe. Also, the pictures are absolutely gorgeous! Thank you, Sarah! Hope you love the burgers! PS I am so jealous of your CSA box! I was wondering how I could make these without the beer. Is there something I could sub? Hey Nicole, just use apple cider, more buttermilk or water. Hope you love these!! I AM SO SORRY! I am aware of the issues and am launching a new site soon. Hopping the site problems will be fixed soon. SO SORRY!! Hi! I absolutely love this recipe! I was just wondering if I can get the recipe for the whole grain pretzel buns, I would love to make them! Thank you! Here is a great recipe for pretzels. Just shape them into buns and then use half whole wheat flour. Hope you love them! I prepared a bunch of patties and have them in the freezer ready to go! Thank you for an awesome recipe! 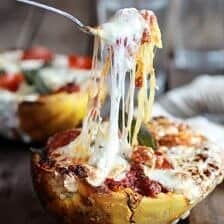 Can these be baked in the oven? I’m worried about them crumbling all over! Wow! these were good burgers! I made them tonight and even though I messed up the recipe they were still delicious; so what did I do? I didn’t have smoked paprika so I add ed Chipolte pepper, My onion rings were way too hot and spicy although we ate a few of them. the burger was a bit spicy too so I ended up adding another 1/2 cup of black beans. Thank you for the creative recipe! It was really good! SO happy you love this burger. Thanks!! 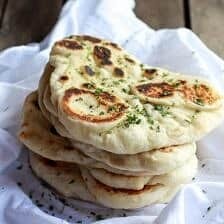 I always come to your blog to browse ideas when I have a few specific ingredients I want to use but can’t think of what to make. Today I searched “sweet potato” and was immediately drawn to this recipe. I wanted to let you know that instead of using the stove top, I baked the burgers at 425° for 8 minutes on a greased foil-covered baking sheet, then flipped and cooked for another 4 minutes and they stayed together perfectly! No crumbling whatsoever. The only change I made to your recipe was to add 1/2-2/3 cup of panko bread crumbs. Keep up the great recipes! You’re my favorite foodie. WOW!! So awesome! I’m so excited that worked!! Thank you for trying that!! I must try next!! This is the first recipe i have made from your site and definitely won’t be the last! This is sooooo good!!! Can’t wait for my vegetarian daughter to try it. I now wish i would of made the onion rings. I had the pleasure of meeting your brother,Brendon, while he was in Spokane and he told me all about your site and I fell in love with how beautiful everything looks. He couldn’t say enough great things about you and your family! Keep up the great job and can’t wait to try the next recipe i will find here. I finally got to make these sweet potato black bean chili burgers this past weekend and it was such a hit!! Thanks, Tieghan for sharing! I am so glad you loved these Bella! Thank you so much! Hey there! Would these freeze well? I have some black beans to use up and would love to make these ahead of time and just pop them on the grill when needed.